An “alarming” proportion of people are now connecting to websites using mobile devices! Recent statistics (ABS Dec 2011) show there are MORE people in Australia connecting to the ‘net with a wireless connection, than those with ADSL. On top of that… there are over 11 million Aussie subscribers with mobile phone internet connections! Your business needs to cater to this mobile audience NOW! Or you will begin to lose customers to your mobile-savvy competition! 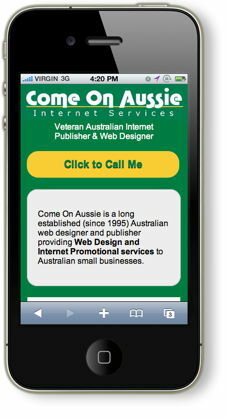 A simple mobile website WILL become THE entry point for small business on the Internet! Mobile is fast becoming THE preferred viewing option for the Internet for thousands of potential customers! And it’s easy to see why… as nothing seems to “cut-to-the-chase” as quickly as a properly designed mobile website!!! Done properly, the flow of information to the customer is FAST and EASY TO LOCATE. Which means they can usually make a buying decision on the spot! The typical “desktop” website however is usually bloated with all sorts of distractions… designed for someone to “browse”… and not designed for someone who is ready to BUY! Most businesses WILL NOT EVEN NEED a full blown desktop website! The mobile version of the website you are currently viewing is properly optimised for both smartphones and tablet computers! It also displays perfectly well on a full desktop computer! Why would you bother “beefing” it up with a “proper” site? Get Ahead Of Your Competition – NOW! The uptake of mobile browsing is happening MUCH FASTER than the Internet “boom” of a decade ago. This is something you should actually act on NOW (or at least VERY soon). You certainly don’t want to wait too long, as you will miss out on a lot of business! And really… it’s not too hard (or expensive) to get started with a mobile site… with around ten hours of work involved for most average websites (not e-commerce enabled… that’s another story). Your mobile website can be designed and built separately to your deskop website… or I can put together a proposal to build both for you at the same time.